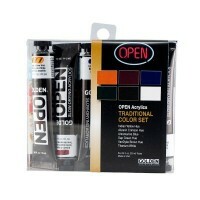 Golden Open Acrylics are a range of slow-drying acrylic paints. 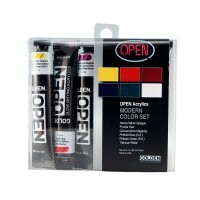 Their increased working time expands the range of techniques you can use to apply your paint, opening up a world of new methods previously limited to oils. You can even use them for some print making techniques! Those who cover their palettes or work from sealed containers can find that they are able to use the same colours for weeks, therefore minimizing waste and preserving your colour mixtures. The drying time of these paints can be adjusted and accelerated by mixing with faster drying colours either from the Fluid or Heavy Body range. Thick applications of this paint can dry extremely slowly, so it is recommended that they are only used for thin applications (<1mm). 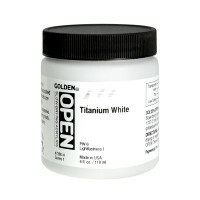 Open Acrylics have a slightly softer consistency than paints from Golden's heavy body range.